Royal Caribbean is gearing up for the new Spectrum of the Seas cruise ship as she is now in the final stages before delivery. The cruise line has released a new video of the ship during the complicated River Ems conveyance. 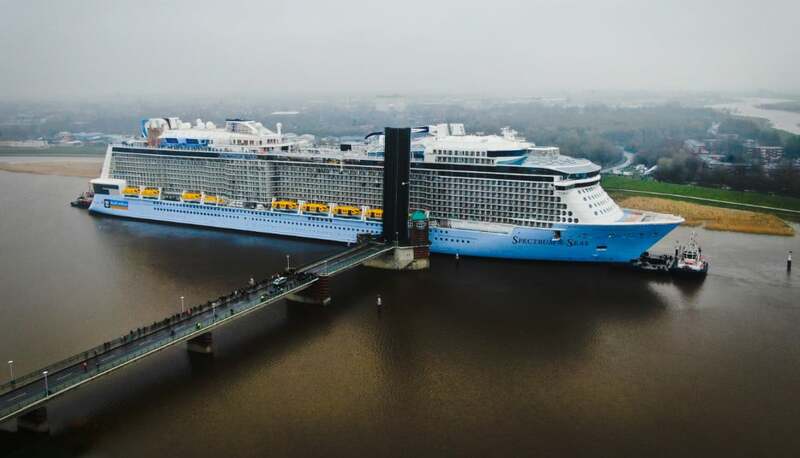 The new Royal Caribbean cruise ship has completed her River Ems conveyance which is a complex process across almost two days. Early morning on March 20 the Quantum-ultra class ship passed through the first lock and departed the shipyard for the final time. We actually posted some of the first photos as the ship first started her conveyance after a delay due to weather conditions. Spectrum o the Seas made it to the River Ems barrier at around 10:15 PM on March 20 where the sip remained until the following day. The new vessel finally arrived at the Eemshaven, Netherlands at around 7:00 AM and while there will undergo sea trials and the final touches of fitting out. The new ship has been purpose-built for the Chinese market and will be based there after an epic 51-night global odyssey voyage starting from Barcelona, Spain on April 18, 2019. Starting in June 2019 she will be based from Shanghai and then in the winter season will be based from Hong Kong. Spectrum of the Seas is an evolution to the popular Quantum-class ships including Quantum of the Seas which was the first to arrive in 2014. Once fully completed the new Royal Caribbean ship will be 169,300 gross tons with a guest capacity of 4,188 at double occupancy.